While we've misplaced the video evidence, senior editor Michael McWhertor and I recently pretended to go on a date. For work purposes. We were in Tokyo. We were at an arcade. He wielded a blue, plastic gun. I used a pink one. We were playing House of the Dead EX, which is the only light-gun game I've ever seen that was made for a couple — assumedly a manly man and a girly girl — out on a date. I am sure that either Brian Crecente or Brian Ashcraft filmed us playing EX, but the footage has magically gone missing. It's a scandal. I am reduced, as a result, to painting you a word picture. Imagine McWhertor and me standing in front of an arcade cabinet with the gender-coded guns. As the player standing on the left with the blue gun, McWhertor got to control the shooting-based activities of a burly Frankenstein kind of monster. I was more of a zombie waif. We pointed our light guns at the screen, each got a foot near the pedals at the unit's base, and pulled the triggers to begin. 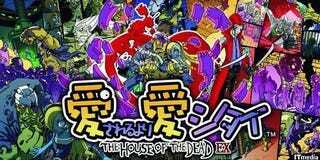 Kotaku had reported the existence of House of the Dead EX back in July of 2008. But we weren't able to experience its interactive combination of horror and romance until our 2009 Tokyo trip. In no time, McWhertor and I discovered that EX is an easy but skewed House of the Dead game. Horror isn't conventional in this game. Monsters will shamble toward you and need to be shot, but how well would your date go if you died quickly and there wasn't an apple-picking side-challenge? Imagine our heroes running left and right across the screen as McWhertor and I shoot apples, hoping the apples will drop into the baskets. Romantic, right? As he scored points, a blue hand stretched from his side of the screen to mine. My points extended a pink hand to the left, until the hands were clasped in heart-shaped emotion. In a later level, we had to use our light guns to repeatedly hammer a door shut so that monsters wouldn't get us. We had to shoot the rotting teeth of a giant monster boss running in our direction. We had to hop across a river and accelerate a car across the highway without bumping into the spiked bumpers of the cars in front and in back of our heroes' autos (foot on the pedal; foot off the pedal). We had to use our gun to shine a spotlight on two rock stars to keep their concert going. You don't beam said spotlight. You keep firing away as they keep rocking out. The game was easy. We smoothly played through multiple branching stages, cycling from starting point to third-level boss battle twice in about 10 minutes. Were Mike and I single and so inclined, would we have found romance playing this game? Perhaps if the one-of-these-people-in-the-couple-won't-be-a-gamer difficulty level could enable just the right amount of nervous laughter and awkward fumbling. Perhaps if the thrill of repeatedly stamping our feet on the pedals and pulling the trigger raised our body temperatures. My suggestion: They should include a requirement for trading light-guns. To force some awkward, accidental touching of hands. I have no idea if this game is available in the U.S. or anywhere else outside of the arcade we found it in, but I believe it would not help you. And you'd be done playing it after one session.